Aside from enjoying yourself with friendly games around the table and late night outs in Las Vegas, finding accommodation suitable for the kids can be troublesome. Fortunately, there are quite a few child-friendly hotels in Las Vegas that not only welcome children, but also provide an array of entertainment to make the experience enjoyable for them too. 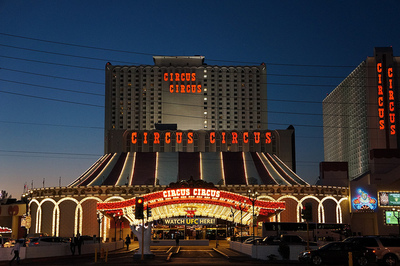 As the fifth largest hotel in the world with the world’s one and only double looped indoor roller coaster, Circus Circus provides the perfect combination for the young and the old on a Las Vegas family trip. The family-oriented casino hotel is also conveniently home to eight full service restaurants, including the Circus Buffet, the Steak House, the Pizzeria, Blue Iguana Authentic Mexican Cuisine, the Garden Grill, Westside Deli, Horse-A-Round Snack Bar and Barista Bagels and More. Although Circus Circus doesn’t offer childcare services, the Adventuredome is bound to keep the kids occupied. Featuring a 4D Special FX Theatre, Canyon Blaster, IMAX Theatre and many more, the kids won’t even have the time to complain about nothing to do. With Circus Circus’ 100, 000 square feet casino open 24/7, the adults won’t be starved of entertainment either. A combination of comfort and entertainment, Circus Circus is the perfect choice for families looking for adventure they can enjoy together. 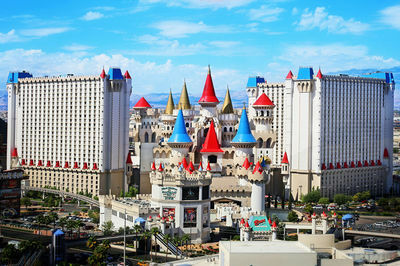 Located toward the South end of the Las Vegas strip, the medieval castle themed casino hotel features many child-friendly activities and amenities making a family stay visit easy and enjoyable. The non-stop entertainment starts with Excalibur’s outdoor swimming pool. The four outdoor pools are each open on different days during the week from morning to night. After sliding down the swimming pool’s water slide, the kids can head to the Fun Dungeon, where they are free to play over 150 family appropriate games, ranging from arcade to sport games. End the night with Excalibur’s very own show, the Tournament of the Kings. The perfect combination of a hearty three-course dinner and an exhilarating live show is based off the tale of King Arthur. The show presents the audience with an exciting live jousting competition between two valiant knights on horseback in a theatre-in-the-round arena. Situated so conveniently in walking distance to five other casino hotels the Excalibur doesn’t deprive its adult guests from the lively Las Vegas casino activities either. For an affordable price and prime location, the Excalibur is definitely a popular location for many families. Featuring an in-hotel childcare center and its very own 70 lane bowling center, the Orleans Hotel doesn’t slack on its family-friendly amenities. The Kid’s Tyme Child Care Center accommodates 2.5 to 12 year old children with its jungle gym, arts and crafts activities and movies. Orlean’s Time Out Arcade is open 7 days a week and features the latest video and interactive games, catering for older children who no longer find the jungle gym quite as interesting. Along with a sparkling oval swimming pool, the hotel’s Spa Orleans and Fitness Center doesn't forget to pamper its adult guests either with its tanning beds, steam rooms and Jacuzzi. You can also choose to enjoy a movie together as a family at Century Orleans, the hotel’s 18-plex movie theatre with its surround sound and state of the art digital systems. 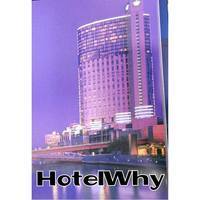 The iconic hotel was the first of the many mega resorts in the famous Las Vegas strip. Although many new and attractive resorts have opened since, the Mirage’s infamous Siegfried & Roy’s Secret Garden and Dolphin Habitat remains a popular attraction for families visiting Las Vegas. Walk right beside the dolphins as they perform jumps and other tricks in the Dolphin Habitat as the friendly trainers share interesting facts about the magnificent animals. The kids will be in awe when they see the Secret Garden’s Royal White Tigers, Magical White Lions, Panthers, and Leopards. 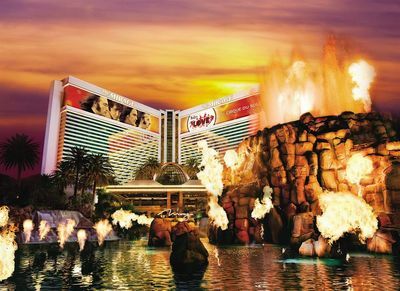 The fun doesn't stop there at the Mirage, watch your kids’ gasp in amazement when they see the Mirage Volcano. The man-made fire, smoke and lava Volcano erupts every night at the very front of the hotel. The Mirage is also home to many famous Vegas shows suitable for the whole family. Enjoy the perfect combination of timeless Beatles music, choreography, and acrobatics at the LOVE by Cirque du Soleil show, and a hilarious and light hearted Terry Factor comedy show with the whole family. The New York - New York hotel contains everything you’d expect to see in a replica New York, with a 150 foot tall Statue of Liberty replica 300 foot long Brookyln Bridge replica. 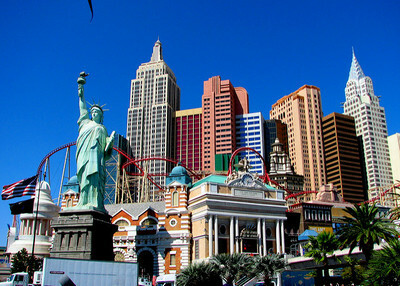 The hotel is dotted with well known New York eateries and branded stores to momentarily take you to the streets of New York. Take the kids on a sweet tooth tour in the Hershey’s Chocolate World two-story store. The kids can try and taste new flavours before they head to the thrilling and infamous Big Apple Coaster. Alongside the 203 foot tall roller coaster, is a slightly less terrifying, but equally fun arcade. The Coney Island Emporium offers over 200 family friendly arcade and video games suitable for those seeking less ‘heart-stopping’ adrenaline rushes. 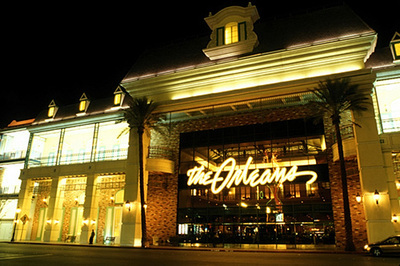 The hotel is located within walking distance from many must see Las Vegas shows and attractions, so don’t even begin to worry about what there is to do for the adults of the trip.